Getting All the Money You Need to Do All the Deals You Want…And Have People Begging to Give You More!!! Atlanta REIA Members Attend for NO CHARGE. Guests pay $10 at the Door. Access to money is a key component in the success of a real estate investor. The more access you have, the more opportunities will be available to you. Come out this month to the Atlanta REIA Wild Wild West, where we are excited to have our good friends Mark and Anne Lackey as our special guest speakers. The Lackeys have raised close to a million dollars using a proven method that they will share with us. The meeting will take place on Monday, September 28th at 6:30PM at the Cherokee Cattle Company located at 2710 Canton Rd in Marietta. Finding private money is a huge challenge for many investors. Banks are generally not too helpful to investors, especially full-time investors who don’t have high earning full time J-O-Bs. Many sellers want cash, which leaves you, the investor, stuck trying to make deals work without access to the funds. By implementing the steps that the Lackey’s will teach you, your business will be able to take off to new heights! Come prepared to roll up your sleeves and start working on your private money pitch. This will be great meeting where you will gain confidence in your ability to find and secure private funds. Don’t miss it! Mark and Anne Lackey are well known around Atlanta and across the nation as Real Estate Investors, Authors, Speakers and Educators as well as REALTORs. They coach and train hundreds of US and Canadians to a successful real estate career. 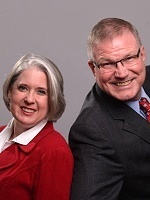 Mark and Anne have written multiple Best Selling books and developed multiple Educational Programs and systems for many areas of Real Estate Investing. Today, Mark and Anne control and manage over $3M in passive income producing residential properties, (aka rentals) in their own portfolio, and manage $23M of income producing properties for other investors. Each year they find, fix-up and flip multiple properties for profit and have transacted over $35M in real estate over the past 5 years alone. They operate multiple businesses and they do everything together. See you at the meeting! Don’t forget to wear your cowboy hat and boots for an extra tickets for the drawing for great door prizes. You could even win a FREE Vacation for TWO to Cancun! The Atlanta REIA West Monthly Meeting is an Atlanta REIA Subchapter led by Leslie Mathis that is held on the 4th Monday of each month at 6:30 PM at the Cherokee Cattle Company located at 2710 Canton Rd in Marietta. The next meeting will be held on Monday, September 28th at 6:30PM. Atlanta REIA Members can attend for FREE and guests for $10. Show up at 6:30 PM to eat and network before the meeting officially starts at 7:00 PM. Buying your own meal is optional but highly recommended and greatly appreciated since the Cherokee Cattle Company allows us to use their meeting room. There will be lots of learning and lots of networking. Bring your deals and your haves, wants and needs to the event. See you at the meeting on Monday, September 28th at 6:30PM at the Cherokee Cattle Company located at 2710 Canton Rd in Marietta!